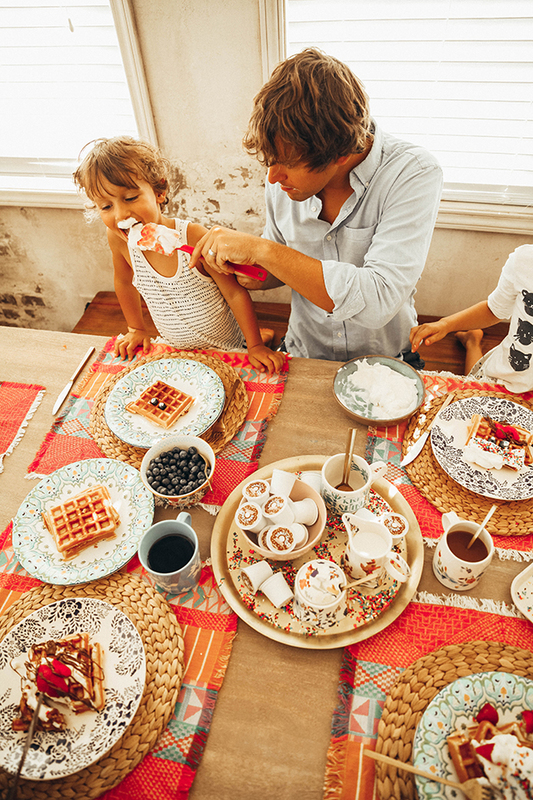 Sunday is the day we catch up with family or friends over brunch, so it is a day we all look forward to! Everyone usually brings a dish to share, and we create a big spread in buffet style. 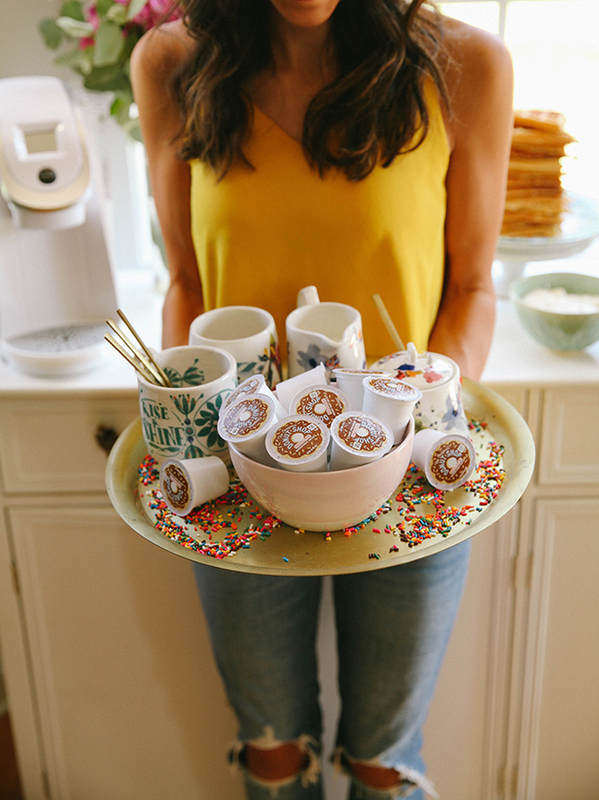 This time around we teamed up with The Original Donut Shop® Coffee pods to come up with a full spread coffee + waffle bar! This is the coffee Gabe and I look forward to sipping on each morning. 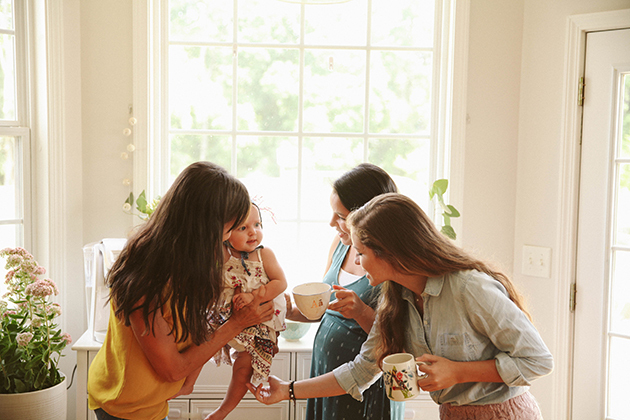 That might have to do with the pace of life with little ones as we know it…;), but it also has that robust kick that makes you believe you can conquer the day after a good mug full. 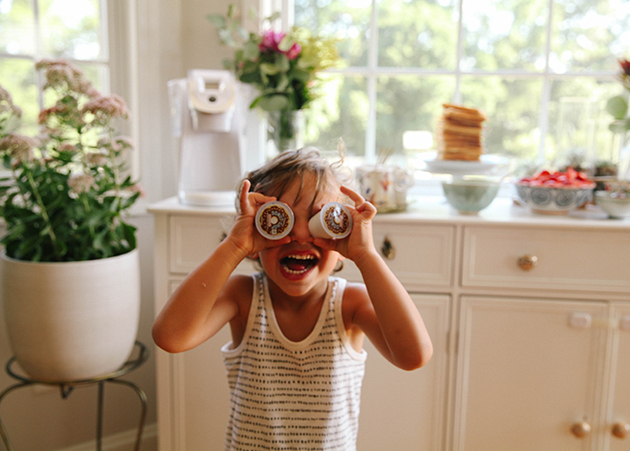 We held an impromptu silly face contest for the kids to make on top of their waffles, and we had quite the range of characters! Props to Veronica for the rainbow sprinkle hair, but I am pretty sure Max’s chocolate beard took the prize. 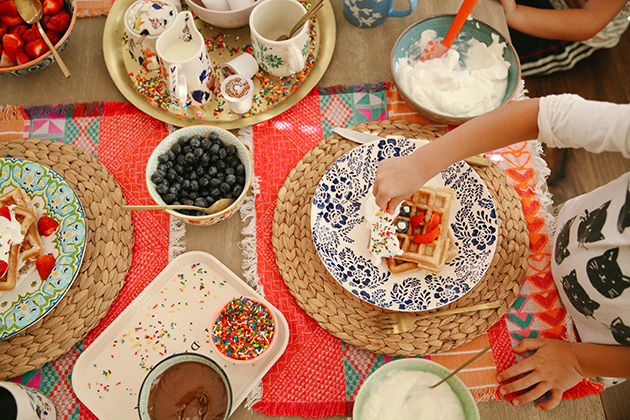 I have a feeling my kids will be requesting the Sunday funday waffle bar every week from here on out! It’s been such a welcome change to have most of my family in town now, so coming together for some quality time together is a great refuel before the week begins! It helps to have that set aside time in the week to gather together, catch up, and just have a good time! 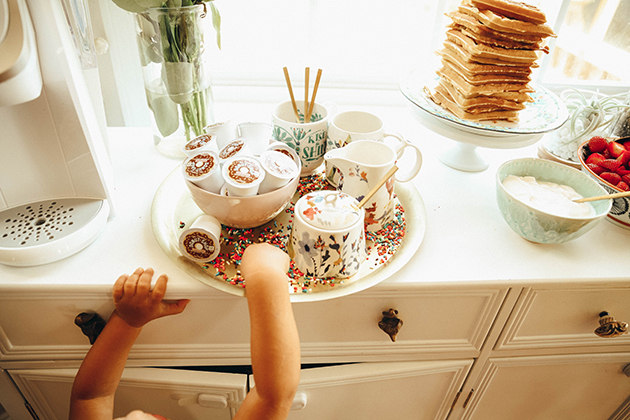 Our house is often the hang spot, so having a breakfast bar with a good cup of coffee in hand is my ideal kind of hosting situation! Thank you to The Original Donut Shop® Coffee and Keurig, for sponsoring this post! Hey! I love this! 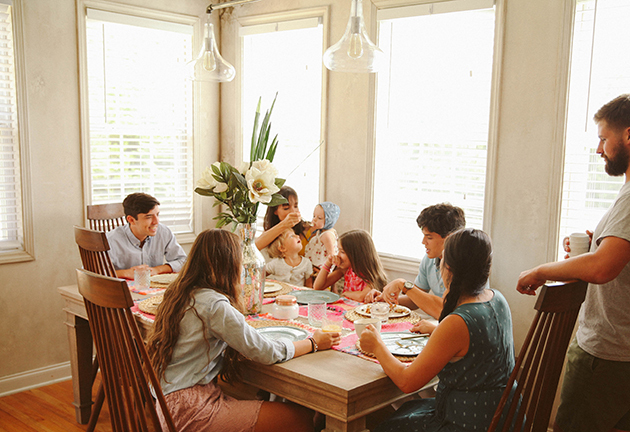 Such a great idea to do with friends&Family to catch up. Also, I wanted to ask, the mugs and milk jug 🙂 where are they from?? What a beautiful setting and so inspiring! Think I’m going to host a weekend brunch myself soon too! This is such a neat idea! 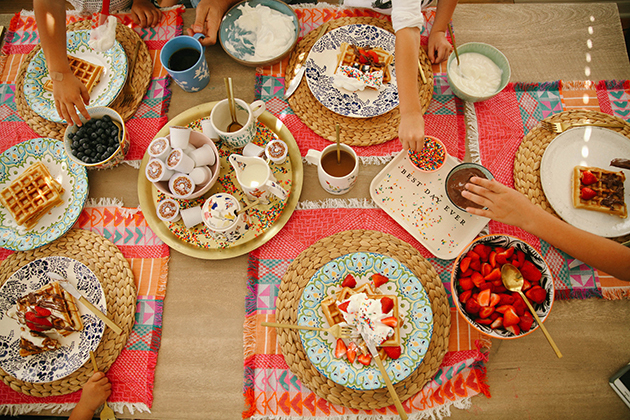 It reminds me of one time, when I was a kid, when my family did a pancake bar and invited friends over. 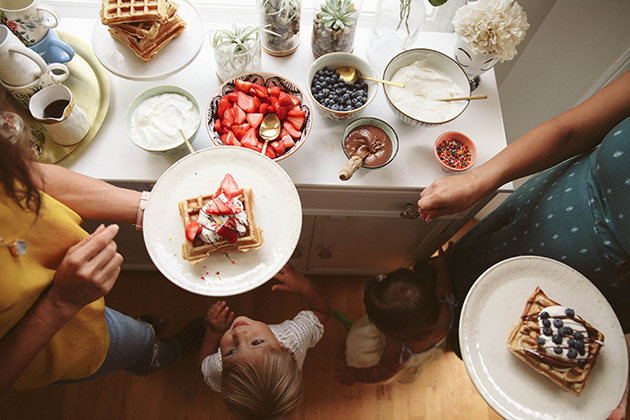 Delicious, easy, and a big hit for everyone 🙂 I am a huge fan of waffles, so I might have to try this some time-my big question is: What is your strategy for making enough waffles for everyone without it taking a long time? Do you have multiple waffle irons, or do you make them in advance and keep them warm in the oven, or do you do something else? This looks so yummy! 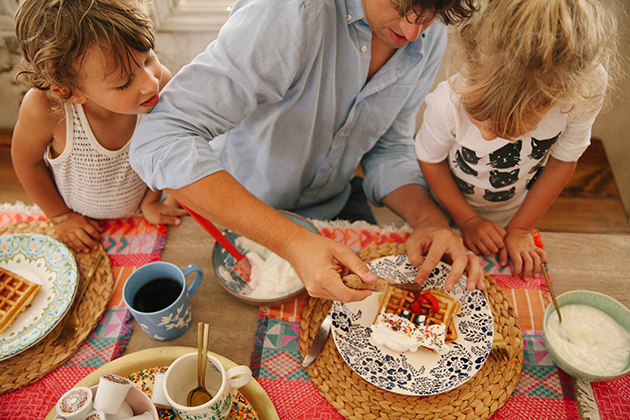 Waffles and weekends just belong together! These were the substitution for my other kcups at last weeks click list pickup and I ALMOST sent them back, BUT these photos are giving me all the feels and I’m definitely going to open them and give them a try now! 🙂 On a scale from 1-10 what’s the sweetness level? They gave us the sweet and creamy. Have a wonderful week!